The Chihuahua originated in Mexico, not the state of Chihuahua as the name suggests, but probably from the southern part or whole of Mexico. They first came to prominence in Mexico City around 1895. It is believed to have originated from an earlier breed known as the Techichi, popular in the seventh century. Legend suggests that the ancestors of the Chihuahua were sacrificed at the time of the death of a human and the sins of the person were transferred to the dog, which appeased the gods. Carvings resembling the breed can be found in the pyramids of Cholula, Mexico. The smooth coat Chihuahua in its present form has been developed by American breeders during this century. 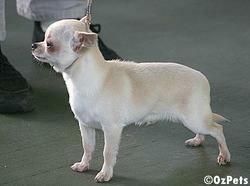 The American Chihuahua club was established in 1923 dedicated to the betterment of the breed. The smooth coat Chihuahua still retains traits of its original ancestry, being the open fontanel, Molera, and the flat furry tail. There were only smooth coated Chihuahuas in Mexico, the long coat Chihuahua is entirely an American made breed. It is believed that the long coated Chihuahua evolved from crosses with Papillons and Pomerians. Other cross influences are said to be with the Pekingese, Yorkshire Terrier and the Poodle. The long coat Chihuahua is an extremely beautiful toy breed and has retained the original features of the true Chihuahua. The open fontanel is less common in the long coat Chihuahua. The obvious difference between the smooth and long coat Chihuahuas is the coat, the long coat is "long" and either flat or slightly wavy with a soft texture. The long coat Chihuahua requires regular grooming. Chihuahuas are small, dainty, graceful and alert little dogs. They are the world's smallest dog and have also become one of the most popular. They are extremely cheap to feed, do not require much room, little exercise, have no doggie odour, travel easily, and little maintenance. They come in any colour. Importantly though Chihuahuas must live indoors. 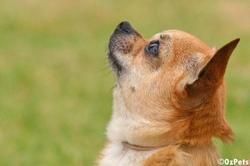 The lifespan of the Chihuahua is on average 10 to 13 years, though many Chihuahuas are know to have lived beyond this. They are small dog in a big dog body being fearless and great watch dogs. They are great with other animals, though being fearless can sometimes get them in bother especially if it is a big dog they don't know too well as size does not concern them. They are extremely devoted to their owners but remember they are likely to be the smallest member of the family so need protection from children and/or large animals who like to play rough. They are a very social dog so if they are going to be left home alone often the Chihuahua may not be a breed for you. 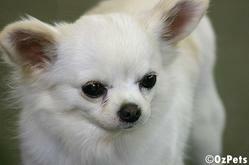 In summary the Chihuahua are playful and graceful little dogs. They are tiny in size so are not suited for rowdy families or outdoor living. They are an ideal apartment dog and do not bark much. A loyal, smart, incredibly loving dog that would make a great companion for anyone. Size: Ideal weight up to 2.7 kg.